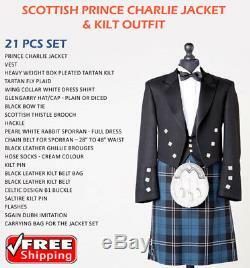 Scottish Prince Charlie Jacket & Kilt Outfit 21 Pcs Scottish Men Wedding Outfit FREE P&P. Beautiful Scottish Wedding Suit For Men Scotland Traditional Style. 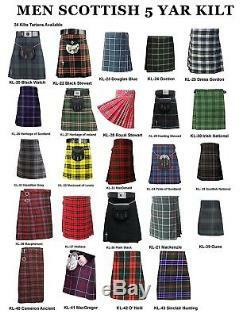 Available in All Sizes and We have Various Colors & 25 Tartans for Kilt & Jacket. Heavy weight box pleated tartan Kilt. Wing collar white dress shirt. Glengarry Hat/Cap - Plain or Diced. Pearl White Rabbit Sporran - Full Dress. Chain Belt for Sporran 28 to 48 waist. Hose Socks - Cream colour. Hand Embroided Scottish Thistle with Pin. Black Leather Kilt Belt Bag. Carrying Bag for the Jacket set. Prince Charlie Jacket & Vest Specifics. Jacket Size: 38, 40, 42, 44, 46, 48, 50, 52, 54 & 56 Chest Size. Your max chest size is your jacket size. Sleeve sizes varies from 23 1/2 to 26 1/2 as per the jacket size. Sleeve length is measured from shoulder end to cuff. The vest is a formal dress outfit. Material is 100% pure wool black barathea. Square metal buttons with Rampant Lion image. Shinny satin lapels on the jacket. Heavy weight kilt 13 oz material with 24 regular drop. 30 to 46 Waist available and its artificial/acrylic Wool. Cloth length is 6 yards with box pleats and last pleat reversed to back. Kilt has a fringed apron along with 3 metal buckles and leather straps. Sole: Leather Sole with Steel edge on heel for max sound. Laces: Black laces, with fringed leather ends and long enough to tie around your ankles. 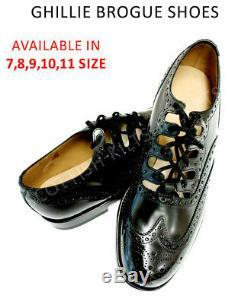 Available shoe sizes: 40,42,44,46,48. Wing Collar Dress Shirt Specifics. White wing collar dress shirt made from fine cotton fibre. Available sizes: Collar - 14 1/2", 15", 15 1/2", 16", 16 1/2", 17", 17 1/2", 18" & 18 1/2. Pom: 1 Red Pom on top. Plain Black or red diced. Available sizes: 7", 7 1/4" & 7 1/2. Things to do when you checkout. Jacket size (according to the size chart attached). Sleeve length (shoulder end to cuff). Shoulder width: Back Length (do not include tails in back length). Shirt size by collar: Plain Black Bow Tie OR Matching Tartan Tie. Socks colour (cream or black). 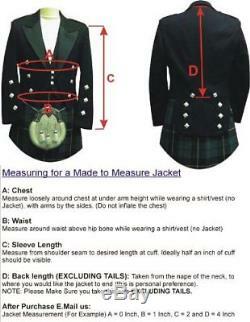 Kilt Tartan & size (waist size). Black Watch, Royal Stewart, Mackenzie, Heritage of Ireland, Heritage of Scotland. Scottish National, Wallace, MacLeod of Harris, Freedom, Cameron Modern. Hamilton, Fraser, Black Stewart, MacLeod of Lewis. Pride of Scotland, Gunn, Douglas. Hunting Stewart, Gordon, Rangers, Hunting MacGregor & Plain Black. The item "Scottish Prince Charlie Jacket & Kilt Outfit 21 Pcs Scottish Men Wedding Outfit" is in sale since Saturday, June 23, 2018. This item is in the category "Clothes, Shoes & Accessories\World & Traditional Clothing\Europe\Other European Clothing". The seller is "scotsman-kilt" and is located in St. This item can be shipped worldwide.